A jewel has risen form the former rail yard of the northwest corner of Grant Park in Chicago. All of its facets are shining brightly. Michigan Avenue should be proud. 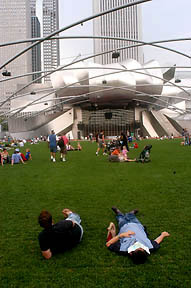 Millennium Park, consuming 24 acres of Grant Park, cost a mind-boggling $475 million to construct. Beset by years of cost overruns (originally budgeted at $150 million) and construction delays the "city of big shoulders" should be happy to see that it's reputation for bold and daring architecture reamins fully intact. The centerpiece of Millennium Park is the 120-foot high Jay Pritzker Pavilion - brashly designed by Frank Gehry, the famed architect who designed the Guggenheim Museum in Bilbao, Spain, and the Walt Disney Concert Hall in Los Angeles. Its stage is surrounded by billowing curves of stainless steel and a skeletal trellis of curling steel pipes that will house the sound system throughout. The pavilion will hold 4,000 people in fixed seats and another 7,000 in the lawn. Let's hope that the city is willing and able to book a varied menu of performers here on a steady basis. 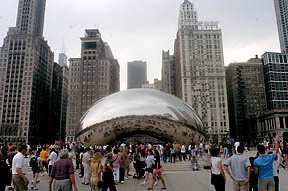 "The Bean" a 110-ton sculpture of seamless, highly polished stainless steel plates that reflects everthing around it. As you walk around "the Bean" the abstract reflections increase as you move faster. The distorted image of the cityscape is breathtaking. 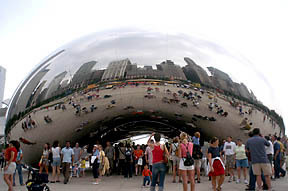 Designed by Indian-born artist Anish Kapoor "the Bean" is a bold exclamation mark on the whole project. Two 50-foot-high towers of glass brick, border a long reflective pool. 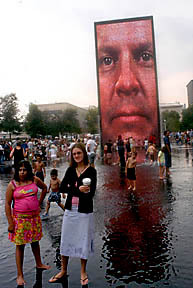 The whimsical towers have changing video images of over 1,000 Chicagoans' faces. Sometimes winking, and sometimes smiling the faces that delight the park goers the most are the ones that purse their lips and let a long cooling jet of water shoot from their mouths. As the tower grows dark - a rush of water forming at the top - comes cascading down on the waiting park goers below. 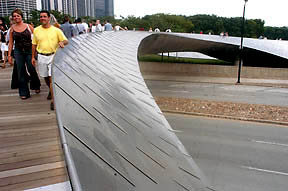 The brushed stainless steel bridge - also designed by Frank Gehry - snakes its way from Millennium Park across Columbus Drive to Lake Michigan. The wooden planks that form the walkway create a natural contrast to the modernist serpentine shell outside. 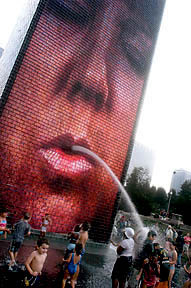 Daring and brash - Millennium Park has set the mark very high for future architectural projects in Chicago. Lets hope the vision points towards tomorrow without discarding the past. Only problem is - couldn't they have come up with a better name.